With two months to go, we're happy to report that we've confirmed our venue of choice, the beautiful St Hilda's Anglican Church in Katoomba (pictured, right). With a lovely tall nave, stained glass windows, glass doors to bring people in from the main street of Katoomba, and the friendly Reverend Ray Robinson it'll be a great venue for the first ever Vertical Film Festival screenings on the evening of 17 October. St Hilda is regarded by some as patron saint of culture, so that bodes well too! 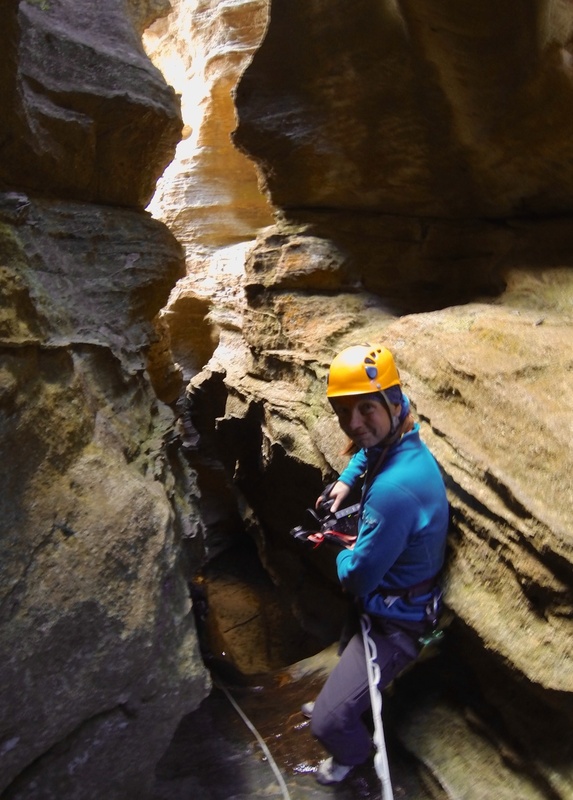 In the meantime I, along with VFF coordinator Natasha Sebire (below), have been out shooting a vertical teaser for the festival in Tiger Snake Canyon in the deepest, darkest parts of Australia's Blue Mountains. It proved to be a steep learning experience, pardon the pun. Even us verticalistas forgot to rotate the camera 90º on a few occasions, so ingrained in us is the horizontal mode of filming. Also, how exactly does one capture L/R stereo audio when the microphone is vertical?! A lot of the time we decided to use the camera handheld. Lenses with image stabilisation were ideal for this purpose, and most likely we'll add some shot stabilisation during editing as well. We look forward to showing the finished film soon.